To say that climate change is an important issue is an understatement. Global warming is a very real threat to humanity which is something almost all of the major countries agree on. In this climate change report, we cover the most important topics including how the advantages of solar energy can help. There are thousands of planets in the universe, some with characteristics suitable for the existence of life and others so hot, so cold, or so toxic, that the existence of life as we know it may seem impossible. However, besides its ideal position with respect to the Sun, there is an extra component that makes planet Earth unique in our galaxy: the existence of the ozone shield. What Are the Consequences If We Do Not Act to Stop Carbon Emissions? Is It Too Late to Stop It? The ozone shield is a layer in the stratosphere of the planet with just the right size (almost miraculously) to reflect the excess ultraviolet radiation that comes from the Sun (which would be harmful to life on Earth). This layer only allows 70% of the incoming solar radiation to reach the atmosphere. This amount of radiation provides the exact levels of heat and light that allow the existence of life on our planet. This ozone layer is composed of the so-called Greenhouse Gases (GHG) that include water vapor, methane, nitrous oxide, ozone, chlorofluorocarbons, hydrofluorocarbons, and carbon dioxide (CO2). The accumulation of GHG creates a layer that reflects the UV radiation and concentrates the incoming heat from solar radiation in the atmosphere of the planet. This allows planet Earth to keep its temperature levels within ranges suitable for living, that would otherwise be too cold for the existence of life. This is a natural process called Greenhouse Effect, and it has occurred over millions of years. However, increasing the amount of GHG above normal values has a negative effect on Earth’s temperature because the layer becomes thicker than what it should be and heat increases radically, leading to high-temperature values with bad consequences for the planet. Carbon dioxide levels have oscillated around the 200 parts per million in our planet, historically reaching a maximum of 280 parts per million. However, since the industrial revolution, carbon dioxide levels have increased to astronomic values close to 400 parts per million. Changes in the available amount of land and trees. Increases in greenhouse gas emissions. While solar irradiance fluctuations and volcanic eruptions are naturally occurring processes, all of the other causes are directly attributed to human activity. Therefore, scientists agree that there is no other natural source of explanation for this rapid increase in CO2 levels than human activity. And it is not a surprise to jump to that conclusion when you take a look at CO2 emissions data from several countries. According to data from 2017, around 10 gigatons (Gt) of CO2 were emitted in China, over 5 GtCO2 in the US, around 2.5 GtCO2 in India and nearly 36 GtCO2 all over the world. Watching the time evolution of carbon emissions from 1960 to 2017 leaves no doubt that we are the cause of climate change. According to NASA, since 1900 the temperature of the Earth has increased 1°C. However, if global temperature increases over 2°C, there may be no going back, and the effects of climate change would be unavoidable. Increasing Earth’s temperature has several consequences for us. The first, and one of the most dramatic consequences, are rising water levels. Recent studies from NASA on Greenland and the Arctic have demonstrated that continental-size ice formations are melting down due to the excess heat, and they have reduced nearly 10% in the last 30 years. All of that melted ice goes to the ocean and is now attributed to sea level rise in the US and all over the world, even reaching distant locations like Indonesia, China, and Japan. Moreover, other consequences of climate change are related to longer and harder droughts across the world, which also leads to less productive and less nutritious crops. With the Earth population’s Increasing without control, drought seasons will have a significant impact on the food supply of our nation, increasing the cost of food and possibly leading to famine in poor countries. Destruction of the ozone layer is also a secondary consequence of climate change. As heat concentrates further in the atmosphere, the contrary process occurs in the stratosphere. As the stratosphere cools down, and the atmosphere heats up, there is a warming-cooling dynamic effect that causes ozone loss. Due to this ozone loss, the ozone layer depletes and leaves the ground wide open for ultraviolet radiation to reach our atmosphere. This can easily be seen in the ozone hole in the South Pole. Heat waves are also a direct consequence of climate change. They mean more frequent wildfires, longer droughts, and deaths. Actually, heat waves are considered one of the major causes of death from natural disasters, mainly due to heat strokes that are caused because the human’s body is unable to cool itself down due to the high humidity in the atmosphere. Stronger hurricanes, storms, snowfalls, hailstorms, and sandstorms can also be attributed to consequences of climate change that will intensify due to radical temperature changes. These consequences and others may not last centuries to become real, but some may only take a few years. According to the IPCC report from 2014, the energy supply sector accounted for almost 50% of all GHG emissions, making it the largest contributor to global GHG emissions. Despite the Kyoto Protocol, GHG emissions of this sector increased 36% between 2000-2010, where the major contributors were CO2 emissions from coal (43%), oil (36%) and gas (20%). Here you can take a look at the contributions from these sources over time. Moreover, the report emphasizes that transport is another important sector which contribution accounts for almost 23 % of total energy-related CO2 emissions. To reduce the effect of this sector on carbon emissions, it is necessary to lower the energy intensity by enhancing vehicle and engine performance and substituting oil-based products by natural gas, bio-methane, biofuels or hydrogen. The Fourth National Climate Assessment Report from the U.S Global Change Research Program, released in November 2018, has announced an alarming top date to make a significant impact on carbon dioxide reductions. According to the report, if CO2 emissions are not cut 45% by 2030, then it will be unavoidable to reach 1.5°C increase in Earth temperature. A range between 1.5°C and 2°C was established in the Paris Agreement, however, reaching 2°C would already mean reaching to worst climate change consequences, therefore, it cannot be seen as a threshold. Besides, the report concludes that by 2050 carbon emissions must be cut 100%, making a complete transition to renewable energy sources. The report addresses remarkable impacts that have already been seen in American ground related to wildfires (Northwest), droughts (North and Southwest), hurricanes (South), floods (South East), water and transportation failures due to heavy snow, heat waves, and soil erosion (Midwest). Based on these results, the US report focuses on the imminent need to reduce the amount and speed of future climate changes by reducing GHG, replacing CO2, and emitting fossil fuel energy sources with zero-emission technologies such as geothermal, wind, biofuels, hydro and solar. As one of the most commonly available, accessible, and feasible renewable energy options, solar panels are one of the main drivers in the reduction of carbon emissions across the globe. We can estimate the reductions in carbon emissions by using solar panels thanks to the IRENA calculator. The latest data available on the tool is from 2014 and still we have an idea of the great contributions of solar energy into the market. Experiences in the US have shown that around 17.5 million tons (MT) of CO2 can be avoided which translates into 22,000 GWh of electricity. China also made incredible contributions that reach 20 MT of CO2, and 25,000 GWh of energy injected to the grid. Germany was the greatest contributor in that year with 29 MT avoided and over 35,000 GWh produced. This can be translated into 18 million tonnes from coal sources, 3.38 million from natural gas, and 9 million from oil sources. The contributions from other countries like Japan, Italy, Spain, France, UK, Australia, India, and South Korea were able to amass almost 80,000 GWh together and 63 MT avoided CO2 emissions for the environment. As solar energy keeps growing every year, these numbers have already surpassed the estimated values. 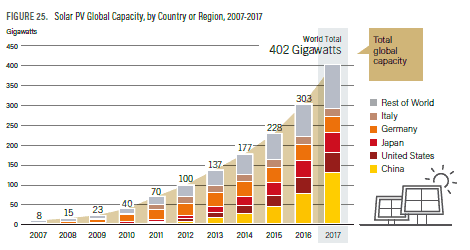 As a reference, nearly 177 GW of installed capacity were available in 2014, but in 2017 around 402 GW of installed capacity are available worldwide. Meaning around 130 % of growth in only 3 years. One of the best ways that you can contribute to the fight against climate change is to install solar panels on your house. Solar energy presents a set of advantages that can be used to offset carbon emissions and to help your wallet as well. The main drawback from using fossil fuels as a source of energy is that to generate electricity, we need to burn them, which leads to high carbon dioxide emissions that contaminate our planet and accelerate climate change. 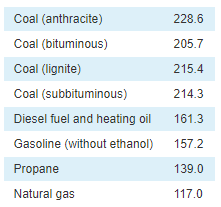 You can see below, the amount of CO2 produced when a fuel is burned as a function of the carbon content. On the contrary, one of the intrinsic advantages of solar panels is that they are a sustainable and clean source of electricity production, therefore they emit zero CO2 because the process to generate electricity is done at the molecular level without the need to burn any component with carbon. Fossil fuels are sources of energy that exist because of decomposed plant or animal matter at high-pressure levels that accumulate underground over thousands of years. Since planet Earth has millions of years of existence, you can imagine the amounts of accumulated matter. However, despite their abundance, they are still exhaustible sources of energy. In other words, once we extract them all, there will be no more electricity. And it takes millions of years to accumulate the amount of fossil fuels that we will consume in 200 years. The Global fossil fuel reserves left are estimated to be 114 years for coal, 53 years for natural gas and 50 years for oil. When you compare that, with the 1 billion years of clean available solar energy that we still have ahead of us, sounds like there is no sense to keep pushing on limited sources of energy that will be over in only a century. Since solar energy is inexhaustible, there is no need to replace it with another resource in the future, assuring a safe and clean source of energy for the centuries to come. Actually, solar energy alone is enough as to provide the entire energy consumption of the world almost 100 times which could be supplied using only 1% of surface area from the Sahara desert. Fossil fuel electricity consists in burning large amounts of carbon sources to generate the energy that the power grid demands through a thermodynamic process. However, it is necessary to keep a constant cycle of extraction of the fossil source. People generally focus on the carbon emissions from these sources at the moment of electricity generation, but they seem to forget one thing, the effects during the extraction process. For instance, coal is generally extracted from the upper portion of the Earth’s crust in ore mines, recovering the coal from the mine using shovels and bulldozers to do the hard work. When mining activities are done, exposed rocks are left behind containing the Sulphur-bearing mineral pyrite. This mineral reacts with water and air to form sulphuric acid and dissolved iron. Then, when the rain comes, the compound transforms into diluted acid that falls into the streams and nearby rivers. Deforestation is also another devastating consequence of coal mining, this is caused by mountaintop removal for the mine. Mountaintop removal mining also releases large amounts of GHG emissions through clearcutting and burning of trees which can represent close to 7% of a coal power plant GHG emissions. On the other hand, the solar industry has focused on providing reliable quality standards to manufacture solar panels that incentivize the market to install PV systems at residential, commercial or utility-scale. One of the basic standards from any PV system is that the array will last at least 25 years. This translates into 25 years where you do not need to worry about electricity generation and where no additional environmental damage will be done to continue the production of energy. When modules reach the end of their useful life, something must be done with the solar panel wastes. Considering just burning them down or throw them away into a pile of waste wouldn’t be exactly environmentally friendly, right? Especially because some of them could even have toxic components like cadmium telluride, indium, gallium and selenide. The great advantage of solar panels is that they can be recycled, extracting mainly aluminum, glass and some minerals like silicon, copper, and polymers. This translates into less burning and more materials that can be used for other purposes and mainly to the manufacturing of new or refurbished solar panels. Some regulations in the EU market known as the EU Waste Electrical and Electronic Equipment (WEEE), already require that manufacturers of solar panels finance the costs associated with collecting and recycling of expired modules. Initiatives like these could lead to the production of 60 million new solar panels by 2030 according to IRENA report. 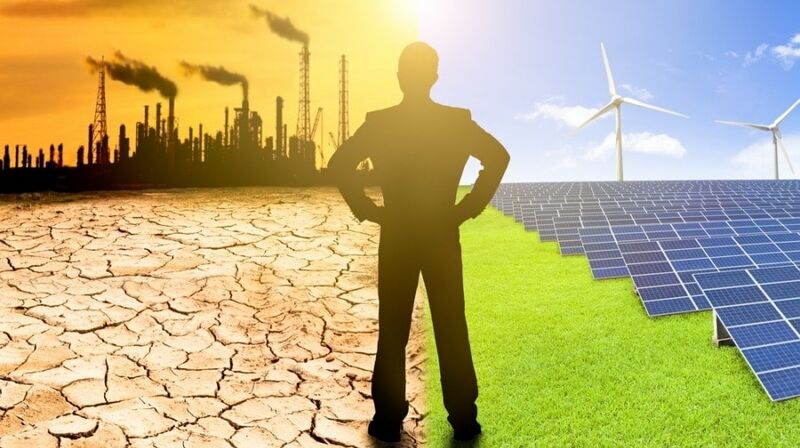 The best advantage of solar energy production for the environment is that there are absolutely no gas emissions attributed during the production of electricity. Meaning no carbon dioxide, sulfur dioxide or nitrogen oxide needed to generate electricity that would be harmful for the human’s health. While we make the transition to an almost complete renewable energy market, we must guarantee supplies of electricity different from fossil fuels. While you purchase solar energy it means that you are not generating GHG emissions to produce the electricity that you need, but it also means offsetting electricity production from other fossil power plants, reducing the GHG from both perspectives. Portable solar panels can also contribute to the fight against climate change since every little drop of electricity that is not taken out of fossil fuels is good for the environment. Moreover, portable solar panels have very important uses in rural regions where access to electricity is limited. Regions like Kenya make use of portable solar lanterns that can provide over 10 hours of light using a rechargeable battery powered by the sun. This avoids the use of other older sources of light like kerosene lamps or candles in regions where there is no access to electricity, avoiding the risks of fire that can be harmful to the environment and for the communities. Such solar panels can be connected to solar generators which allow the storage of power from the sun. The portable solar generators can then be used when needed and can also easily transported for use on the go. RV solar kits are commonly available nowadays because they are a reliable source of electricity when you go camping. Instead of depending on plugging in a campground site which electrical systems may not receive proper maintenance, it’s better to purchase solar panels for camping. This will allow you to feel relaxed because your batteries will be charging with solar energy every day without using electricity from fossil fuel sources. Finally, portable solar chargers installed with solar power banks are also a nice combination to provide an off-grid solution for those people that go camping or that travel a lot around the country. Solar power banks have also demonstrated to be more useful, safe and reliable under scenarios where the regular power grid is not available. For instance, the people from Portable Electric have designed a renewable power source solution for the off-grid sector called VOLTstack. This generator, powered by solar panels, produces no contamination as a diesel generator would in environments such as forests, beaches, and deserts where carbon dioxide should not be emitted. Actually, under disaster conditions like hurricanes or floods, VOLTstack has the advantage of sustainably powering communities that have been affected by these natural disasters in moments when transporting fuel for diesel generators would be very costly and difficult.